It is now the 42nd week of BMT and if want to join and sharpen your brain go click on the badge on top. I got 14 words in 3 minutes. 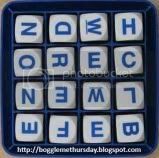 I knowthere are more words to find in the boggle but I am in a hurry right now. Got totake this little rascals out. See you later guys.